Scaffold proteins are known to regulate important cellular processes by interacting with multiple proteins to modulate molecular responses. RACK1 (Receptor for Activated C Kinase 1) is a WD-40 type scaffold protein, conserved in eukaryotes, from Chlamydymonas to plants and humans, expresses ubiquitously and plays regulatory roles in diverse signal transduction and stress response pathways. Here we present the use of Arabidopsis RACK1A, the predominant isoform of a 3-member family, as a bait to screen a split-ubiquitin based cDNA library. In total 97 proteins from dehydration, salt stress, ribosomal and photosynthesis pathways are found to potentially interact with RACK1A. False positive interactions were eliminated following extensive selection based growth potentials. Confirmation of a sub-set of selected interactions is demonstrated through the co-transformation with individual plasmid containing cDNA and the respective bait. Interaction of diverse proteins points to a regulatory role of RACK1A in the cross-talk between signaling pathways. 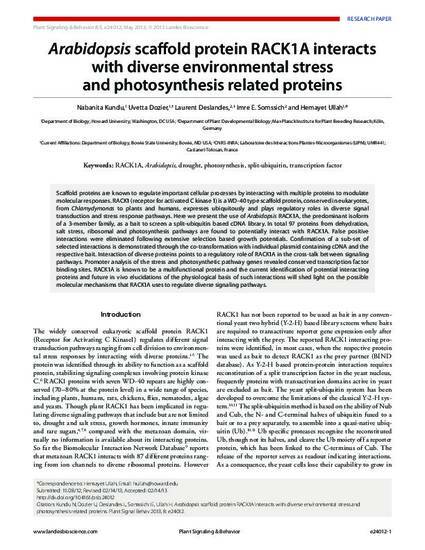 Promoter analysis of the stress and photosynthetic pathway proteins revealed conserved transcription factor binding site. RACK1A is known to be a multifunctional protein and the current identification of potential interacting proteins and future in vivo elucidations of the physiological basis of such interactions will shed light on the possible molecular mechanisms that RACK1A uses to regulate diverse signaling pathways.